Configure and manage the Insight 8-Port 1G Managed Smart Cloud Switch from NETGEAR virtually anywhere in the world with support for the NETGEAR Insight App. This Insight 8-Port Smart Cloud Switch comes equipped with eight Gigabit copper ports and two dedicated SFP ports. Once installed, the switch features 20 Gbps full-duplex bandwidth, a 1.5 MB buffer size, a 16K MAC address table, and support for up to 256 VLANs. 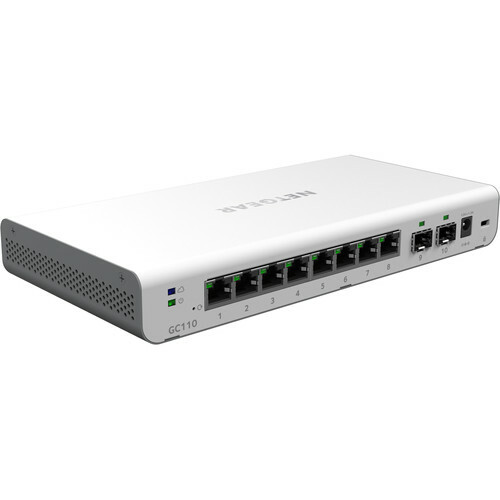 Box Dimensions (LxWxH) 15.2 x 7.5 x 3.2"
Insight 8-Port 1G Managed Smart Cloud Switch is rated 5.0 out of 5 by 1. Rated 5 out of 5 by David from Great Product, Easy to Use Great product, this is really easy and intuitive to use from the iOS app. There is a great amount of functionality below the surface for those that need more advanced features such as Port Forwarding, VLANs, all kinds of things!